There seems to be no truce as yet in the ongoing debates surrounding the Christmas Truce of 1914, from the large number of comments (both positive and negative) that accompanied the release of this year’s Sainsbury’s Christmas advert to whether ‘that’ football match did in fact take place (for an expert summary of proceedings, see truce guru Taff Gillingham’s summary here). With a seemingly widespread popular belief that a single organised match occurred on Christmas day 1914, the evidence to back this up is lacking; yet the ‘myth’ of the football match has taken on a life of its own, perpetuated by the media and official commemorations. This book by Pehr Thermaenius, a Swedish journalist, will do little to dispel it. His approach is to look at one of the kickabouts that is a strong contender for having actually taken place, between the German regiment IR133 and the 2nd Argyll & Sutherland Highlanders. He focuses on two soldiers who belonged to these units, Albert Schmidt and Jimmy Coyle; there is evidence that both men played football before the war. The book follows their journeys from the start of the war to Christmas 1914. Thermaenius states that he has found 29 different accounts of football being played on Christmas day. Frustratingly he does not corroborate this with any further details. The historian in me was crying out for references or at least a comprehensive bibliography. There is too much of a re-hash of secondary sources without questioning their provenance or seeking out the first-hand accounts. 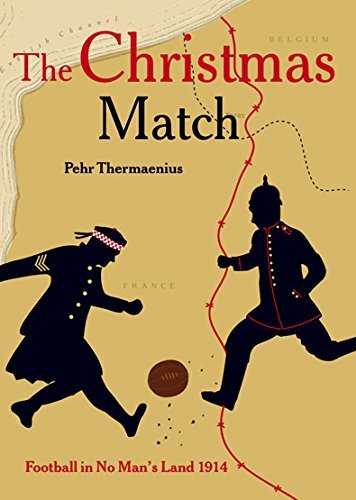 Thermaenius acknowledges that football was only a minor part of the truce; the actual ‘match’ between the Scots and the Germans covers barely 15 of this book’s 200+ pages. The truces that occurred along the line were amazing in themselves, and enough first-hand accounts of them survive to make for fascinating reading. Whilst this account is interesting, ultimately it props up the football myth without fully substantiating it.